Kierikki, Finland - A journey back to the Stone Age! Part 1 of 2! Kierikki in northern Finland is one of the most important archaeological exploratory areas in the country. Excavations started in 1960 and they are still going on the area. 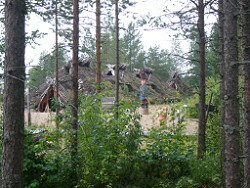 The reconstructed Stone Age village in Kierikki Stone Age Centre, Yli-Ii, in Finland. Photo. A glimpse of the Kierikki Stone Age village seen from the entrance. © Travel Explorations. The houses in the village have been reconstructed according to archaeological findings and allow visitors to glimpse into the lifestyle of the Neolithic Age. Kierikki Stone Age Centre in Yli-Ii, is located around 52 kilometres north of Finland’s forth largest city Oulu. The Kierikki area is in the middle of an extensive Stone Age settlement area. Many secrets of the Finnish prehistory have been revealed thanks to archaeological research. Kierikki's past goes as far back as 7,000 years. In the centre I got an interesting insight in Finnish culture and tales about Finnish Stone Age life. It was an amazing experience walking around there on Thursday 26 July 2007. Not even the heavy rain could stop me from travel through time to the Stone Age. Photo. 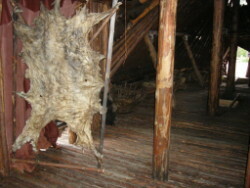 Looking inside one of the row houses in the Kierikki Stone Age Village. It was very dark inside the rowhouses, but the comfort was quite good. The best thing was that the roof protected well from the rain that day. Kierikki Stone Age Centre's main building is one of the world's largest log house and an excellent example of modern log architecture. Inside the centre there is an exhibition where archaeological finds are displayed. It’s also possible to view multimedia presentations in the centre’s auditorium. At a shop visitors can buy unique handicraft products as gifts. Nearby there is a reconstructed Stone Age village, where visitors can see how settlements were established in the Stone Age and what Stone Age life was like. Photo. One of the many forest spirits. © Travel Explorations. I wondered about sacrificing some gifts of food and drinks to make the forest spirits helpful and friendly to me. People lived 5,000-7,000 years ago in Kierikki along the River Iijoki on the sandy banks near the mouth of the river. At the time, the region was rich of natural resources mostly based on seal hunting, and the trade flourished. I could strongly imagine that people lived much in harmony with the wildlife and the land at that time. The village in the area had different kinds of buildings, both single and semi-detached houses. Typically building constructions at that time in Kierikki were the row houses. A village could consist of up to ten such houses side by side, housing a population of 100 – 150 persons. So called terrace houses could be as long as 60 metres. 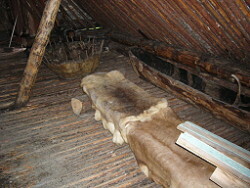 The reconstructed Stone Age village was built based on research data obtained from archaeological digs. Photo. Reconstructed row houses from ancient time in Soumi, Finland. An ancient pathway goes from the main building at Kierikki Stone Age Centre and follows along the river Iijoki. There is also a pathway, made out of sturdy logs, which runs a half a kilometre and leads through the Stone Age settlement to the Stone Age village. I walked this pathway eager to find out more about life in the past. 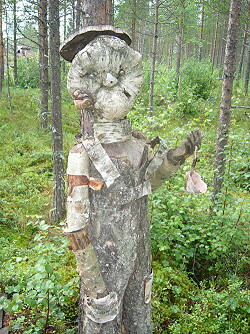 On my way through the pine forest I observed scary figures standing along the path. Actually they were forest spirits. It was totally silence around me, and I was alone with the spirits. Some of them looked pretty evil to me. The dark sky and the heavy rain made the figures even scarier. I hoped the best that they would protect me. I felt lost in to the spiritual world, and I wondered how the Stone Age people practised witchcraft to achieve power from the nature. This article continues in Part 2. Read more here! Read more about the Finnish Stone Age on our website www.TravelExplorations.com. ……at the Kierikki Stone Age Centre in Finland, I really was really amazed to find boomerangs displayed in a museum…. Finland has the oldest Bedrock in EU. It was found in the Siuruankangas heath in the village of Siurua. The rather modest looking rock dates back 3,5 billion years. 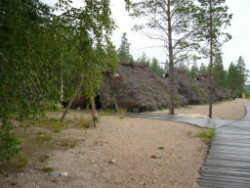 Kierikki Stone Age Centre, Yli-Ii, Finland. Kierikkicenter, Pahkalantie 447, 91200 Yli-Ii. By the Rivers – The Cultural and Nature Route pf Oulu Arc, Kierikki Stone Age Centra, Sini Annala & Sami Viljanmaa. An ancient man has also left his own marks on Finland’s rocks. In 1911 the world famous Finnish composer Jean Sibelius had a walk nearby the summerhouse of his friend. Suddenly he saw grid-like marks high on the cliff of Vitträsk, in Kirkkonummi. Sibelius had actually found the first officially discovered rock paintings in Finland. Today there are over 80 prehistoric paintings found in Finland, and the most typical images are human figures, hand-marks, animals and boats (Source: Finland.com).